Arsenal captain Per Mertesacker to become Arsenal's youth Academy director in a year’s time and will still be part of Arsenal's squad next season. Arsenal are to make Per Mertesacker the head of their youth academy. The German World Cup winner, who has one year left on his current player contract, will still be part of Arsenal's squad next season. 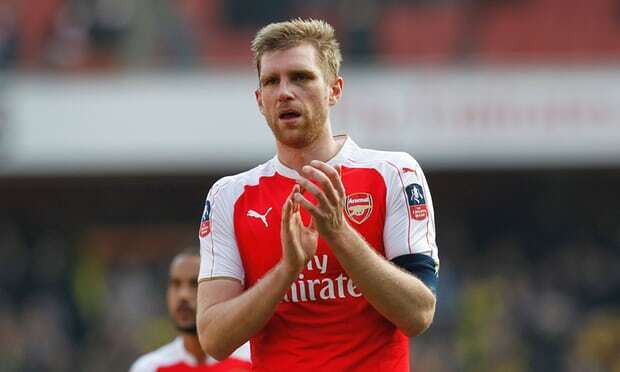 Former Germany international Per Mertesacker will take over from Luke Hobbs as Arsenal's youth Academy director in 2018, the English Premier League club have announced. "For the coming season, [Per] will continue as an important part of our squad while developing his knowledge and understanding of the Youth Academy," read an official statement. Mertesacker's playing contract at the Emirates expires at the end of the 2017-18 season but the 32-year-old has already stated his desire to "remain in football. "This is the start of an exciting new chapter for me and I am delighted that I will be able to stay part of the Arsenal family," Mertesacker said as part of the statement. "This season I will remain fully focused on my job with the team and am looking forward to a successful last season on the pitch." Mertesacker moved to Arsenal from Werder Bremen in 2011 and has spent the last six seasons with the Gunners. He made just two appearances last year, missing most of the season with a knee injury. Compatriot Shkodran Mustafi, who won the Confederations Cup with Germany this summer, has taken his place in defense. The German defender ended his own international career three years ago after Germany won the World Cup in 2014. He is one of 10 players to receive more than 100 caps with the national team. This announcement comes a day after Arsenal confirmed former Germany goalkeeper Jens Lehmann would be joining the club's coaching staff. Lehmann, 47, will reportedly not just be a goalkeeping coach but also will support manager Arsene Wenger with coaching the outfield players.